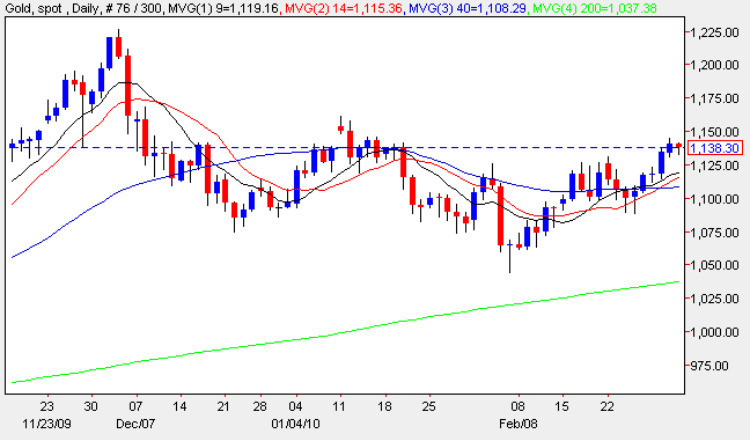 Tuesday’s relatively wide spread up candle on the daily gold chart added a further bullish layer to spot gold prices which are now holding well above all of our four moving averages as we begin to approach the key resistance area at $1150 once again. Yesterday’s narrow spread up bar failed to follow through from Tuesday’s bullish intent but nevertheless continued the upwards rally in an albeit muted fashion. The medium term outlook remains much the same, in that for a longer term rally we need to see a break and hold above $1150 and should this be achieved then the current sideways consolidation should provide us with an excellent support platform for a more sustained move higher in due course.